Hello, I am bit confused about balancing these type of redox reactions where multiple elements are involved in oxidation and reduction reactions. 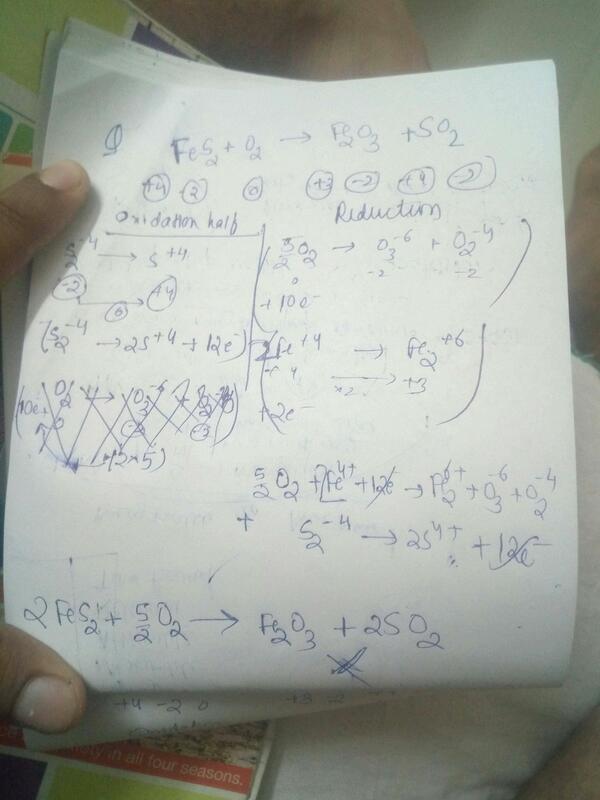 If I try to use half reaction ion exchange method and write reduction and oxidation half separately and then try to neutralise the electrons then I am not able to go to RIGHT solution of this particular reaction. Here is an easy way to balance this. Write the components in their dissociated (ionic) forms, such as Fe2+ + S22- Then write sub reactions, or more properly actual redox reactions. Here 1 for Fe(II) oxidation to Fe(III) by oxygen, and disulfide ion oxidation to sulfur dioxide by again oxygen. Solve these two reactions separately then combine reactants and products in the last step. That is the simple and safe way. Not the answer you're looking for? Browse other questions tagged reaction-mechanism redox or ask your own question.